There has been a lot of talk in the news recently around how Mozilla have changed support gears are are now releasing a new browser version every few month. The affect of this is that a lot of enterprise customers (such as IBM) using Firefox aren’t even finished testing before the next version is released. While corporate customers using Firefox 3.6 are still supported, it would seem that this may not be for long due to the “cost benefit trade” for Mozilla to play in the Enterprise. So to illustrate this I have graphed the number of days that Microsoft supports Internet Explorer compared to Mozilla’s Firefox 4. 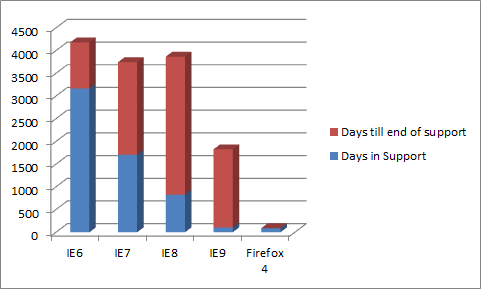 Note: I assume that IE9 will not have extended support lifecycle as it was NOT released as part of Windows 7. Certainly having to support IE6 for over 9 years is a major commitment for Microsoft especially when there are so many security issues… But even while Microsoft encourages users to stop using IE6 http://www.theie6countdown.com/ they continue to support IE6 as promised for the long haul and are certainly not going to be “forcing” anyone to upgrade any time soon. For this reason, plus Internet Explorers excellent out of the box group policy support (for third party see Policy Pak), is why I think IE is hands down best browser for any corporate environment….